Charles Francis Simonds was the eldest son of James and Cecilia Simonds, of Redlands House, Reading. James Simonds was already dead when news came that Charles had been killed in action. The Simonds family were a well-known banking family in Reading. Although the bank, Messers. J & C Simonds & Co. had already incorporated with Barclay’s & Co. Ltd. However, the original brass nameplates could still be seen on the door of the Barclay’s bank which is sited opposite the ‘Jacksons’ corner until Barclays vacated the building. Charles Simonds was educated at Wellington College and Trinity College, Oxford. He served in the South African war as a member of the Berkshire Mounted Infantry and received the Queen’s Medal with four clasps. Charles rejoined the Army in September 1914 leaving his work as a businessman and partner in the Simonds bank. 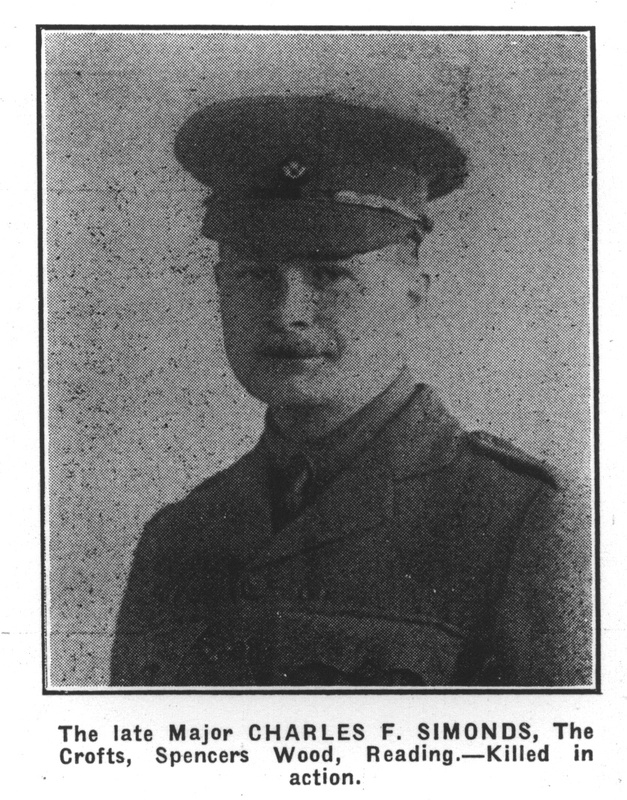 He was gazetted as captain to the Service Battalion of the King’s Royal Rifle Corps. and received his majority February 1st 1915, he went to the front in July 1915. He married Evelyn Hickman, granddaughter of the late Sir Alfred Hickman, in 1907. They had two sons and had their family home at The Crofts, Spencer’s Wood. 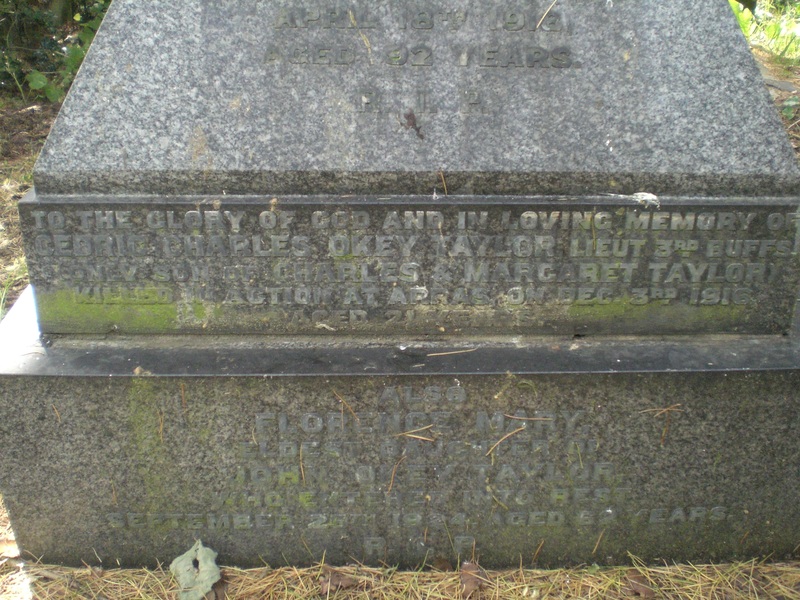 By the time of CWGC registration Evelyn remarried and taking the name of Fuller and moving to Strattonend, Cirencester. 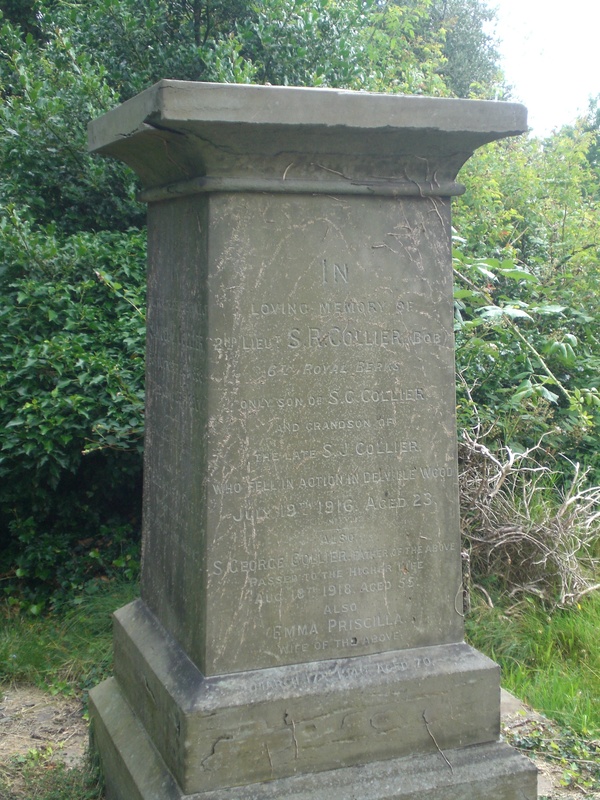 Charles Simonds was well known in Reading as a sports man, he rode to hounds with the South Berkshire Hunt and was a member of their committee. Charles had rowed at Oxford and in his twenties was a member of the Reading Rowing club, serving a period as Captain when the club was particularly successful. Charles Simonds had been home on leave only three weeks before his death. On his return to the front Simonds was charged with the planning of a trench raid. This was carried out successfully due to his outstanding organisation. However, during the accompanying bombardment shells fell on the command dugout, which should have been safe from danger, and Charles Simonds and other key officers were killed instantly. A mining party was sent in immediately to dig the place out and eventually after much heavy digging found the bodies which were removed to the unit church hut. 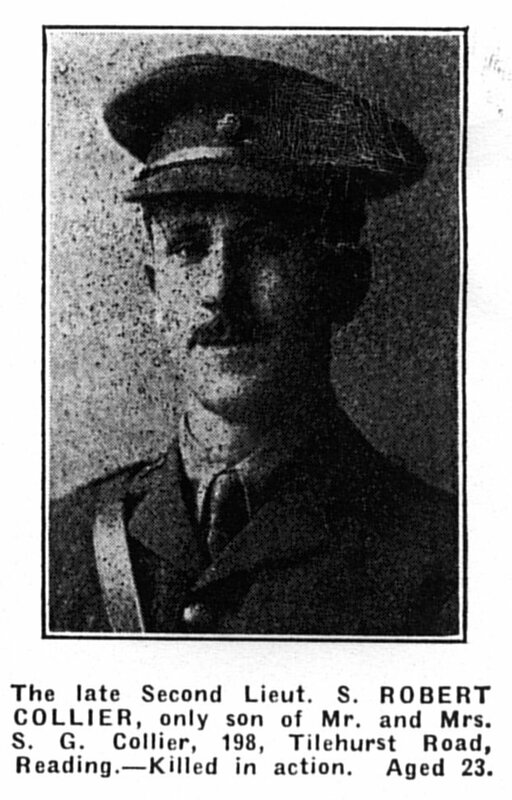 Charles Simonds was killed on 29th June 1916 aged 38. He was buried in Berles-au-Bois Churchyard Extension, Pas de Calais. The unit had been in the village some two months at the time of Simonds death. The grave location is G.5. 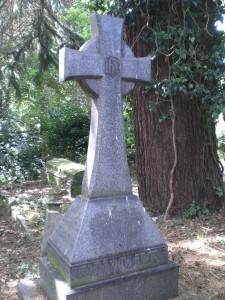 He is commemorated on the Simonds family grave number 2297, in the Reading Cemetery. Berkshire Family History Society classification 45B1. 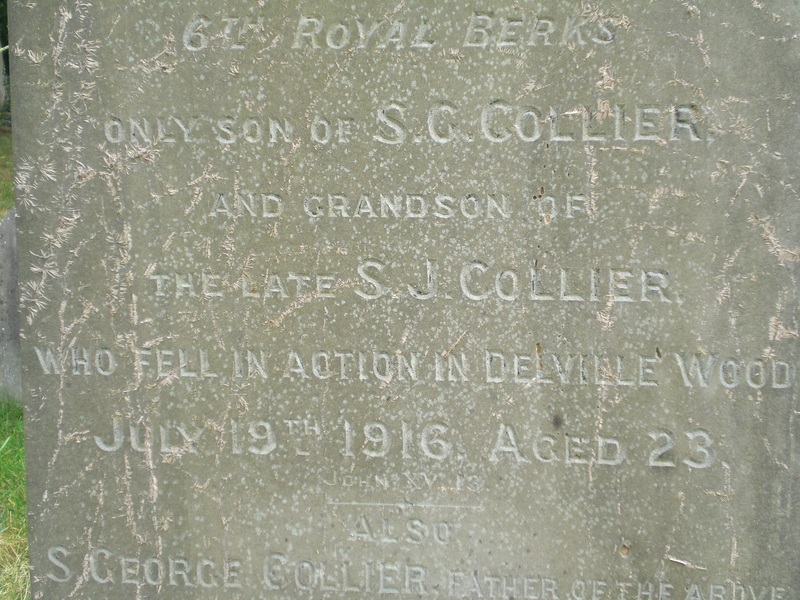 Samuel Robert Collier known as Bob and commemorated as such on his parents headstone was 23 years old when he was first reported in the Chronicle of 4 August 1916, missing believed killed. 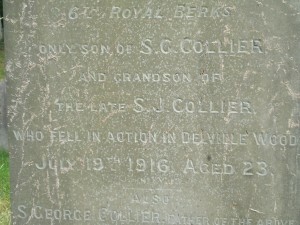 He was the only son of Mr and Mrs S. George Collier, of 198, Tilehurst Road, Reading. He was educated at Marlborough House, Reading, and Bath College. On leaving college he entered Messrs. S. and E. Collier’s Brick and Pottery Works, of which his father was a director. While at Bath college he was in the Cadet Corps for three years and on leaving became Scout Master of the King’s Road Boy Scouts for four years. At the outbreak of war he entered the Berkshire Yeomanry, but later received a commission in the 9th Berkshire Regiment, quartered at Wool. 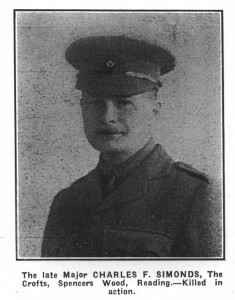 For four months he acted as transport officer for the regiment, and gave it up to take his examinations at Salisbury Plain, and on June 16 1916 he left for France to join a service battalion of the Berkshires, acting as transport officer till July 15, when he took the post of platoon commander, when the usual transport officer returned from hospital. He went into action on July 17 in Delville Wood on the Somme and was not seen after that date. 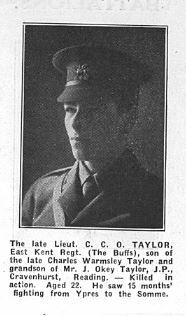 Cedric Charles Okey Taylor was the grandson of a local Reading dignitary. His death is reported in The Chronicle of 15th December 1916. His Captain communicated the news to his mother. He is commemorated upon the grave of his grandfather in the Reading Cemetery and is buried in the Faubourg D’Amien Cemetery, Arras. Location I. J.58. 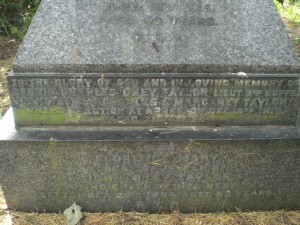 Upon his death he left his estate to his married sister Olive Margaret Okey Allner.